Immediately before any public event, my emotions are on a rollercoaster. I’m over-excited but nervous, stressed and tearful. Usually, I find that I suddenly have a thousand-and-one things to do before I can start preparing for the event. This time was worse because this was my first Book Festival. Somewhere deep in my brain, I knew I could do it. I would not have applied for the gig if I didn’t think that. But 24-hours before, fear took over. There wasn’t even anything concrete I could pin it on. Perhaps if there had been, I could have worked through it. After getting the vital thousand-and-one things done, I prepped for the Festival. Everything was ready to be loaded into my car the next day. That was the moment when I relaxed. Do you remember revising like crazy for exams and then being told the morning of the exam that “you’ve done all you can” or “if you don’t know it now, it’s too late”? That is how I feel before author events. Saturday morning came after a fitful night and I waved my son off to the South East Schools Cross Country Final with my husband (chauffeur and cheerleader for the day). My daughter was already with my parents, having stayed the night so they could take her to orienteering training at the Olympic Park in London. It was certainly a busy day for our family. I breathed a sigh of relief to have the house to myself and got on with the serious business of finding ways to stay calm: loud music and dancing, having a bath and loading the car. Just as the car was ready, my friend, Julia arrived: perfect timing. Julia and I have been friends a long time, since we were teenagers, and despite being a shy person, she’s great at these events with me. Despite saying earlier that everything was ready, we did have to take a detour to buy me a pair of tights and to buy a roll of wallpaper which was a newly integral part of the Storytelling Workshop. My workshops usually begin with some warm-up word games and then go on to create story characters using craft materials, but at the Essex Book Festival, I had 30 minutes less than normal, so things needed to change a little. Having visited the Firstsite venue a couple of weeks before, I was inspired by the blank canvas available to change the concept so that the children instead would become the story characters and then transform the room into their story landscape. I thought it could work, but time would tell, and this was adding to my nerves. It is possible that I got quite a few looks of incredulousness and incomprehension when I explained the idea. But it was too late to make any changes, so before the looks could become thoughts and voices, I quickly had the children call out their ideal characters which I scrawled on a flipchart (note to self: must practice writing on a board!). The children had some great ideas for characters, so the next challenge was to use the craft materials to create the life-size characters. Within 20 minutes, and with help from accompanying adults, there stood before me two dogs, two mermaids, a dragon, a pirate, a fairy princess, a chameleon, a bus driver and a wise old owl. As each child became ready as their chosen character, we came together to chat through a story which could incorporate all the characters. Teddy, the bus driver, hit upon the idea of driving his bus and picking up the various passengers along the way. Obviously with a pirate and two mermaids, we would need to visit the sea, the fairy princess needed a castle and the owl needed a forest. Once again, the children set to work, this time transforming Firstsite into a magical land. Teddy and Dexter built a road; Beau grew a forest; Tabitha, Orlaith and Erin created a stunning sea bay beside a beach; Anjeli built a castle fit for a fairy princess. One day, Teddy the bus driver was driving his bus along a country road when he stopped to pick up his first two passengers: Barley and Louis, the Golden Retriever and Cocker Spaniel. Teddy’s next passenger was Beau, a wise old owl. Before long, they reached the seaside where they could see two mermaids swimming in the bay. But, oh no! They could also see a dreadful dragon and a pirate. As they watched, the pirate told the dragon to heat up the sea with his fire. To escape the hot water, the mermaids swam towards the pirate who captured them. Just then a dinosaur and a chameleon rushed to their aide, and, as instructed by the wise old owl, they frightened the dragon and the pirate who let go of the mermaids. At the same time, the two dogs rescued the mermaids and whisked them quickly to the safety of the fairy princess’ castle. The fairy princess immediately magicked up a beautiful lake where the mermaids lived happily ever after! 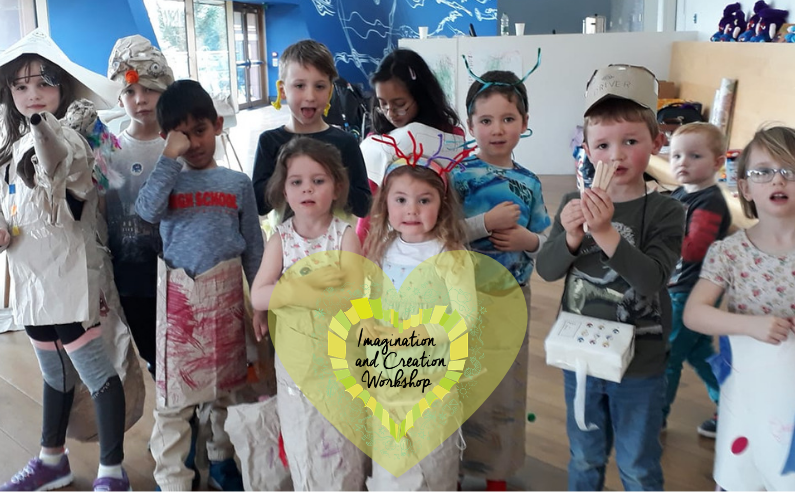 I hope you enjoyed their story, and if your children would like to be involved in a future Imagination & Creation Workshop, please sign up to my newsletter to be the first to hear about events.